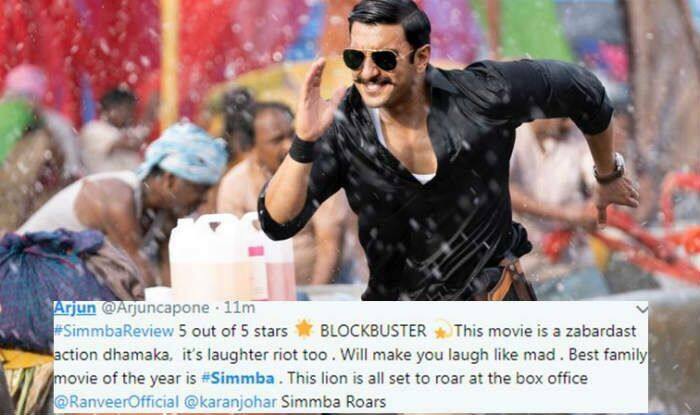 Simmba Twitter Review: The reviews have just doubled our excitement for the movie. People are loving the film. Ranveer Singh– Sara Ali Khan starrer Simmba releases amid high expectations today. Rohit Shetty’s new directorial, Simmba is a Hindi remake of Telugu movie Temper, which features Jr NTR. The film has already garnered a lot of positive reviews from fans. From enjoyable action sequences to Ranveer Singh’s rowdy performance, the film is garnering a lot of praise. Ever since the first trailer of Simmba dropped on YouTube, the internet has been buzzing about Ranveer Sigh’s cop avatar. The critics too have only better things to say. A well-known film critic Taran Adarsh took it to his twitter handle to share the positive review about the Rohit Shetty Film. As per the latest tweet, Simmba has opened with over 4000 screens worldwide. The Rohit Shetty’s film has released at 4020 screens in India and 963 screens worldwide. A Twitter user who watched the early morning show wrote, Rohit Shetty does it again.. He gives Ranveer his career’s biggest BLOCKBUSTER #Simmba..””. Rohit Shetty does it again.. He gives Ranveer his career’s biggest BLOCKBUSTER #Simmba.. What a lethal combination these two are.. I you really love commercial cinema then see it only in single screen.. Guaranteed seeti pe seeti every five minutes.. These reviews have just doubled our excitement for the movie. The film stars Sonu Sood in a negative role and Ashutosh Rana as a senior cop. The movie also stars Sara Ali Khan, who has made her debut opposite Sushant Singh Rajput in Abhishek Kapoor’s Kedarnath.